The Tour Edge Bazooka 360 Senior club set includes an oversized high-MOI 460cc titanium matrix 11.5° driver that promotes greater forgiveness and longer, more consistent shots as well as an oversized 3 and 5-woods that are designed with a low CG to easily get the ball in the air. The forgiving #4 hybrid has a deep CG for maximum carry and soft landing while the oversized irons have an undercut cavity for more forgiveness and a larger sweet spot for higher, accurate shots. The set also includes a classic heel-toe weighted putter with an easy to use alignment aid for more accuracy and a premium lightweight cart bag with divider top and plenty of pocket space. Set includes: Driver, 3W, 5W, 4H, 5-PW, SW, putter, cart bag. 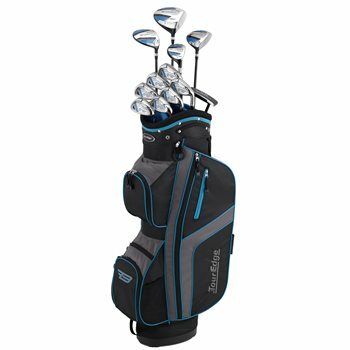 Are there additional pics of all clubs (face, sole, bezel, grip) and bag (divider top, strap, pockets, dimensions, other) available for viewing before purchase?